SK Innovation, the energy holding unit of SK Group, is accelerating its drive to expand its electric automobile battery business by kicking its lithium-ion battery production into full gear. The Korean firm’s newly-expanded battery plant in Seosan, South Chungcheong Province, has more than doubled its annual production capacity from 300 to 700 megawatt-hours -- sufficient to power around 30,000 electric vehicles, the company said. Since the factory first opened its doors in September 2012, it has been enlarging its production lines every year to meet rising client demands, with the latest expansion completed in May. The Seosan plant added a new production line this year to produce more batteries to be placed inside electric-powered vehicles by major automakers -- the Kia Soul EV and China-based BAIC Group’s EV200 and ES210, according to SK. 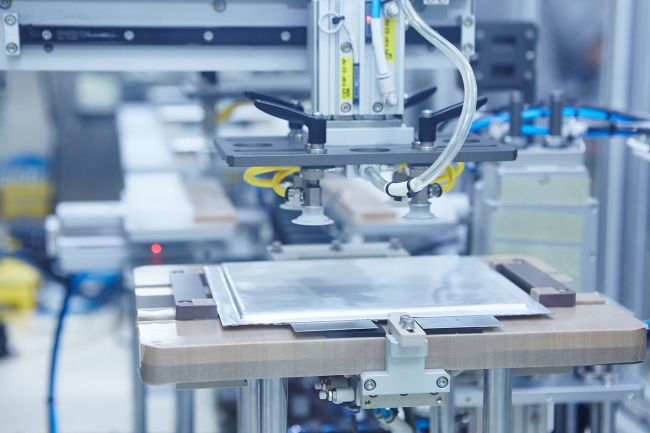 From the initial electrode manufacturing process to the cell assembly, cell activation and final packaging stages, the plant is churning out new battery packs nonstop, every day to fulfill its target quotas on time. The nation’s leading energy firm is pinning high hopes on its expanded production capabilities to significantly drive up annual profits, as it looks to record a threefold increase in sales this year. The plant is also at the center of company CEO Chung Chul-khil’s ongoing efforts to reform its business structure by strengthening select businesses and finding new sources of income in cooperation with overseas companies. “Though we understand that the battery development business is a difficult one, we will not give up,” Chung told local reporters in May, reaffirming the company’s commitment to its fledgling rechargeable battery business. The energy firm is particularly looking to direct its efforts on developing energy cells suited for plug-in hybrid electric vehicles and BEVs, or vehicles powered solely by batteries, according to vice president of SK Innovation’s battery business Kim Yoo-suk. “We will focus on developing next-generation lithium-ion battery cells with higher energy capacity and concentration, perceived as holding great growth potentials,” Kim said Wednesday. Despite its limited resources and small size compared to rivals -- including the world’s top electric car battery producer Panasonic, as well as Samsung and LG -- SK Innovation is continuing to seal more supply deals with clients at home and abroad. In January 2014, SK Energy joined hands with BAIC’s Beijing Automobile Works and liquid crystal display manufacturer Beijing Electronic Holding to establish Beijing BESK Technology, which has paved the way for the Korean energy firm to expand its presence in China’s burgeoning electric-powered vehicle market. The Korean energy firm is also expected to further step up production after reportedly having sealed a deal with a major European automaker to develop car batteries to be placed in its EVs from 2016. The supply volume would be nearly “three times larger” than the combined output for its current clients, according to CEO Chung in May. “On the back of our standout technology, SK will maximize its operational efficiency and strengthen cooperation with existing partners to better target the domestic and global electric car battery market,” said SK Innovation’s head of Battery and Information Electronic Materials Kim Hong-dae.